Crystal Design is the dream of any modern, sophisticated women. Featuring fresh silhouettes, avant-garde fabrics and innovative lace textures and patterns. There is equal parts romantic and chic; beading and gorgeous embellishments accentuate the unique, clean designs. The collection aims to highlight the breathtaking beauty of a woman in love. 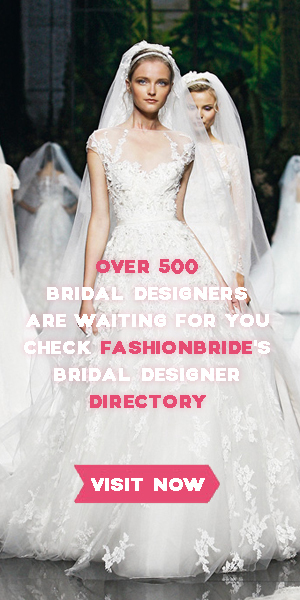 TheFashionBrides is a complete guide to all bridal designers, national and international, with the best wedding gown selection on the web. The site is a chic and stylish wedding blog featuring an inspiring mix of beautiful and timeless wedding gowns selection, fashion, trends as well as adjacent wedding details such as decor, cakes, centerpieces and bouquets. The blog is updated with fresh content everyday including 2 new unique bridal collections.